The original look of the C-HR, complete with Scion badging. When the C-HR concept debuted at the LA Auto Show in 2015, it was presented as a functional yet sporty Scion. Scion VP Andrew Gilleland said the C-HR embraced the different and weird way the auto brand operated and wore it like a badge of honor. In developing a car that embraced the urban lifestyle, Scion thought they'd found their ringer. Of course, Scion announced the brand would be discontinued in 2016, and their rise and fall has been well documented. Along with a handful of other Scion mainstays (FR-S, iA, and the iM), the C-HR was moved over to Toyota. 2. What Does It Stand For? The C-HR is named after its Compact size and High Ride height, according to its original press release. However, other sources claim it stands for "Coupe High Rider." Unfortunately, we'll only be getting the base version of the C-HR here in the US. That doesn't mean that the 2.0L 4-cylinder engine isn't capable - its 144 hp paired with a continuously variable automatic transmission provides excellent performance. But we're still a little jealous of Europe, who will receive the Turbo and Hybrid versions. 4. It's Going To Be Safe. REALLY Safe. Though AWD won't be available on the C-HR (FWD only), Toyota's new crossover will feature a forward collision warning system, lane departure warning, steering assist, pedestrian detection, automatic emergency braking, and automatic high beams. These standard features make the C-HR one of the safest crossovers on the market. While less edgy than the exterior, the interior of the C-HR is still a sight to behold. The cabin of the C-HR isn't as eccentric as the exterior, but it's still an eye-catching dream. The first thing to catch the eyen is the blue trim that flows throughout the interior like a mountain stream. The horizontal-styled dash is topped with an infotainment screen, and the charcoal upholstery pulls together the whole look. While Toyota hasn't officially released interior specs for the C-HR, we're assuming the general lack of switches and buttons means most commands will be controlled via voice activation or touchscreen. 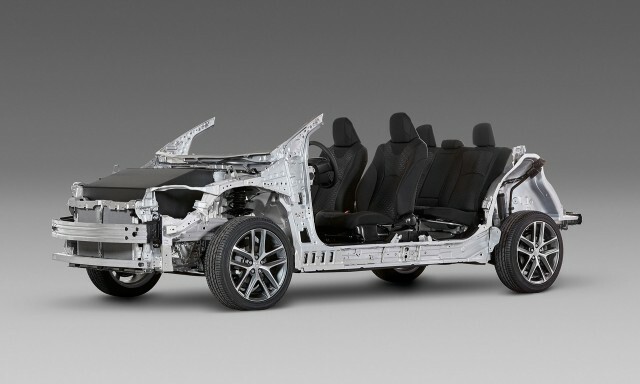 Toyota's TNGA platform is designed for multiple mid-size cars. The C-HR will share the TNGA platform with the new Prius, which was tuned at the Nürburgring in Germany. The new platform, designed for mid-sized cars, features reduced weight and increased performance, resulting in a 15% rise in fuel efficiency. While the Prius was the first to benefit from the new platform, the C-HR will make use of every new feature the TNGA provides. 7. Starting MSRP And Its Debut Are still A Mystery! We know the C-HR will debut sometime in 2017 as a 2018 model; however, the exact date and price are still unknown. As a direct competitor to the Kia Soul and Nissan Juke, we expect it to start in the $20k - $25k range.